but none of them seem convincing to me. The trade-offs would have to be pretty significant, like collecting that 20 percent of GDP via a flat tax and enacting deep entitlement reform. I think you need to look at this two ways. First, there’s medium-term deficit reduction, which is perhaps a little easier than Williamson makes it out to be. 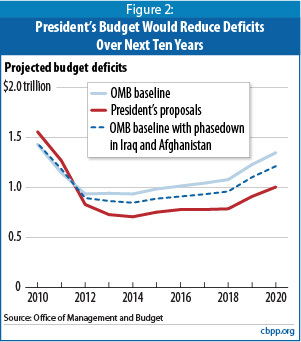 A lot of the current federal deficit is driven by a combination of increased spending and decreased tax revenue caused by the Great Recession, and as the economy improves and stimulus spending ends the deficit will drop dramatically all on its own. Further combinations of spending cuts and tax increases to reach primary balance (i.e., excluding interest payments) would be on the order of $250 billion or so. In rough numbers, this means a 5% increase in taxes plus 5% decrease in non-entitlement spending. That’s a lot, but it’s not fiscal Armageddon. Longer term, the problem is worse, primarily because of growing healthcare costs. But while I may be a crazy optimist, I think there’s at least some hope of getting a bipartisan consensus on long-term cuts to the growth of Medicare and Social Security combined with long-term tax increases to support somewhat more modest versions of those programs. I know there doesn’t seem to be much hope of that at the moment, but the only question is how long it’s going to take before everyone’s heads get banged around enough that they realize they have no choice. Maybe in 2013, after Obama has won a second term and the screechers in the Republican Party have yelled themselves hoarse and the adults finally decide to take over. It sounds like a longshot, but it’s not impossible. Ideally, what I’d like to see takes a few different tacks. First, national defense needs to be on the table for spending cuts every bit as much as any other discretionary program. Second, we need to get serious about reining in healthcare spending. This really does require bipartisan consensus since neither party can afford to make the unpopular decisions this will require on their own. Third, do a simple deal on Social Security that balances its long-term prospects with a modest basket of growth cuts and payroll tax increases. This really ought to be easy since Social Security’s deficit is genuinely small and manageable. And fourth, start thinking seriously about alternative sources of tax revenue. It doesn’t have to be income taxes and it doesn’t have to be a VAT. The combination of a financial transaction tax and a serious carbon tax would raise a considerable sum of money and would do it by taxing activities that we’d like to see a little less of anyway. This is all pie in the sky at the moment, and I think Williamson’s dream of keeping federal spending to 20% of GDP is just that: a dream. But at some point in the near future we either get our act together or else the entire country turns into California. And we’ve already got one too many Californias.